About Traditional Prague Northern Soul event at amazing place Cafe Royal. See the calendar! Three days. Three different places. Welcome to Prague in the place where the soul hearts beats so fast. LIne up of seven international DJ’s supported by Prague Allnighters team. Enjoy the beauties and hospitality of our lovely city and friendly people. Tři dny plné skvělé hudby na třech rozličných místech. Již tradiční Northern Soulový večer v krasném prostředí v centru města. Prijďte tančit pod taktovkou rezidentních DJ’s MR CAT, BUQI, PATH a speciálních hostů. MR CAT, PATH, BUQI and special local guests. What can we offer? Eight hours of Northern Soul classics. Friendly smiling people, fully enjoying the night and dance. Lovely city with magic atmosphere, great beer, great meal. Osm hodin Motown a Northern Soul. Již tradiční Northern Soulový večer v krasném prostředí v centru města. Prijďte tančit pod taktovkou rezidentních DJ’s MR CAT, BUQI, PATH a speciálních hostů. Three days. Three different places. Welcome to Prague in the place where the soul hearts beats so fast. Line up of seven international DJ’s supported by Prague Allnighters team. Enjoy the beauties and hospitality of our lovely city, friendly people and do not forget DANCE, DANCE, DANCE. Tři dny plné skvělé hudby na třech rozličných místech. Již tradiční Northern Soulový večer v krasném prostředí v centru města. Osm hodin Motown a Northern Soul. Již tradiční Northern Soulový večer v novém krásném prostředí v centru města. What can we offer? Eight hours of Northern and Motown classics. Friendly smiling people, fully enjoying the night and dance. Lovely city with magic atmosphere, great beer, great meal. Join our club and enjoy all the beauties with us. Gonna be a long night! Osm hodin Motown a Northern Soul. Již tradiční Northern Soulov večer v novém krásném prostředí v centru města. This year newly in the special venue in the city center. What can we offer? Seven hours of Northern and Motown classics. Friendly smiling people, fully enjoying the night and dance. Resident DJ’s MR CAT, BUQI, PATH and special guest Rob Messer!!! Sedm hodin Motown a Northern Soul. Jiz tradicni Northern Soulovy vecer v novem krasnem prostredi v centru mesta. Prijdte tancit pod taktovkou rezidentnich DJ’s MR CAT, BUQI, PATH a specialniho hosta Rob Messer. The Originators - located in the Amsterdam area – intend to transform a dream into reality; relive the days of the British Mod scene and the Northern Soul era. With heavy beats, up-tempo songs and the unmistakably soul driven vocals of Natazz, Maud and Barbra, the songs of artists like Gloria Jones, The Exciters, Maxine Brown and Beverly Bremers are brought back to life. The eleven-piece band completely captures the unique sound of Northern Soul music, taking you back to the late 1960s and early 1970s, where music was felt in every fibre of your body. They create a nostalgic memory, a current experience to never forget and a clear road to a future where soul music will live on forever. Londýnská r'n'b - soulová parta vyráží na evropské turné a zastaví se i u nás, v Bubnu. New Street Adventure odchovaní hudbou Curtise Mayfielda nebo Bobbyho Womacka přináší northern soulové dědictví novým generacím. Debutové album No Hard Feelngs, i tři vydané singly sklidili pozitivní reakce po celé Británii. Jak se bude líbit u nás? Adventure capably blend their Northern Soul heritage with an underdog grit and a social commentary nous. The EVERETTES are a soul band from Berlin, fronted by the singers Laura, Katharina and Jess. Arisen from the Floorettes, the band keeps the faith to their musical inspirations: Northern Soul and 60s girl group style. With charm, vitality and a bunch of good songs they are going to put a smile on your face. K třetímu výročí naší soulové noci jsme si pro vás připravili opravdovou lahůdku. Již tradiční rezidentní partičku našich djs doplní britská legenda Northern Soul scény Kev Roberts. Od opojných dnů Wigan Casina v roce 1973 hraje Kev Roberts důležitou roli ve světě SOULOVÉ hudby. Jako klubový DJ v 70. letech byl zodpovědný za popularitu mnoha písní včetně hitu Top 30 s MISTUROU (The Flasher). Během raných let svého klubového života uváděl, mezi stovkami dalších, the Four Tops, Supremes, The Miracles, Billy Ocean. Jako zkušený moderátor rádia Gold dělal rozhovory s více než 300 osobnostmi od Cliffa Richarda až po Beach Boys. Jakožto o někdejším kandidátovi na Sony Award, the New York Times v roce 2006 o Kevovi prohlásily v dnešní době jeden z nejzkušenějších chlápků ohledně retro hudby v hudebním průmyslu. On the third anniversary of our dance night we have prepared for you a special gift. Traditional DJ crew of resident DJs gonna be strictly supported by the British legend of Northern Soul scene, Mr. Kev Roberts. During his early club life, he MCd the Four Tops, Supremes, The Miracles, Billy Ocean among hundreds of others. As a seasoned Gold radio presenter, Kev has interviewed more than 300 personalities ranging from Cliff Richard to The Beach Boys. A former Sony Award nominee, the New York Times in 2006 said about Kev one of the most knowledgeable Retro music types in the industry today. Listen to invitation for next Prague Allnighters night and come! 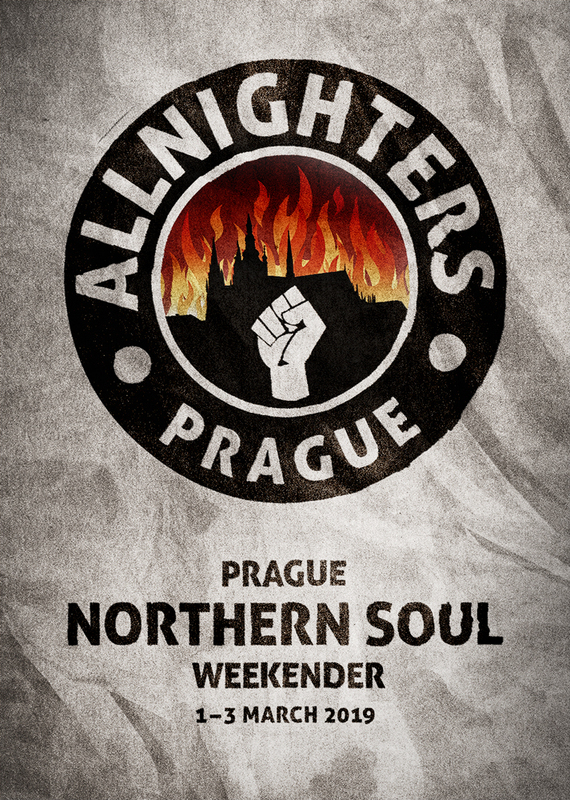 Prague Allnighters - eight hours of Northern Soul and Motown. Traditional Prague Northern Soul event at amazing place KZ Domovina, Magic atmosphere of northern England clubs in 70’s + dance floor area of 240m2 offers all dancers maximum comfort for their best performance. Combination of event with beauties of Prague promise one of the best summer weekend you can live through. Prague Allnighters - osm hodin Motown a Northern Soul. Již tradiční Northern Soulový večer v krásném prostředí KZ Domovina s magickou atmosférou sedmdesátých let severní Anglie. Taneční parket o rozloze 240m2 nabízí všem tanečníkům dost prostoru pro nejlepši taneční výkony. Kombinace této skvělé akce s krásou Prahy slibuje jeden z nejhezčích možných letních víkendů, které stojí za to prožít. CHECK OUT FB EVENT HERE! Come and join our club! Po šesti měsících odmlky jsme opět tady. 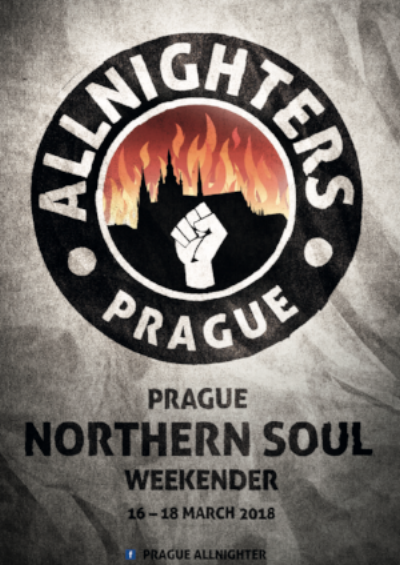 V pořadí již osmý díl pražské Northern Soulové noci Prague Allnighters je na světě! A co nás čeká? Kromě již tradičního line-up rezidentních DJs MR.CAT, DJ PATH a DJ Buqi i speciálni host ze Skotska SCOT JAMES, který působí ve Stockholm Club 5:15. Krásný taneční parket o rozloze 240 m2 nabídne všem náruživým tanečníkům maximální komfort pro skvělé taneční výkony. Takže doražte a užijte si to! comfort for their best performance.